As a human race, we haven’t exactly been the best guests on planet earth from time to time. As climate change and global pollution levels increase, it’s our responsibility as residents of the earth to slow and eventually reverse the effects of our destructive behaviour. To do this, we begin at home. Embedding a green living ethos into your household and teaching your children to respect the earth they live on could really make a difference in their future. ‘Being green’ isn’t a huge lifestyle change; it merely requires curbing a few of our bad habits and helping the environment in the process, not to mention the money you can save in energy costs. Follow these tips and get some creative ideas on how you can show your children what it means to be green. Energy is what powers our homes: what keeps us warm in winter and cooks our food all year round. Teaching your child about where energy comes from could really help give them a basis to understand why energy saving measures are so important in our current situation. Buying Smart meters from JSG solutions can help when educating your children on the use of energy. By doing this, your child may also have a better grasp of the theoretical principles taught to them in school in science class. It is likely that as time progresses, more and more emphasis will be placed on renewable energy generation, which has already become apparent in many areas around the world. Due to this being the case, it would perhaps be worth teaching your child why this is happening. What is a fossil fuel? Why can’t we use them forever? What are they doing to our environment? These are the sort of questions that your child may want the answers to, and it is our job as parents to guide our children towards a sustainable future. As a follow on from energy, the use of water is also rather important, especially seeing as energy is still part of the heating process of said water. A good example of unnecessary water usage is in the shower. The average water usage for an 8 minute shower is around 16.4 gallons (62 litres), which is nearly as much as the average bath which uses roughly 21 gallons (80 litres). This estimate doesn’t apply to power showers, however, which use an unbelievable 36 gallons (136 litres). By reducing the amount of time you allow your kids to spend in the shower, they can learn a valuable life lesson and do their bit towards the environment in the process. Plants are the backbone of our existence. Down to the smallest shrub, plants create the oxygen that we breathe and in the case of trees, capture the carbon dioxide that is contributing to global warming. Growing a plant could be a great project for your child to take pride in, following the progress of the plant’s development, following the progress of the plant's development from a tiny sapling, all the way to when it's grown large and needs the help of a tree surgeon, and in cases of food producing plants, eating the fruits of your child’s labour (quite literally!). Many laundry detergents are now being made with sustainability in mind, meaning that clothes can be washed at a much lower heat. Using one of these detergents will not only save you huge amounts of money in water and heating bills, but will allow your child to get accustomed to green habits when doing laundry chores. Remember, filling your loads to capacity is the most efficient way of washing your clothes, as one large wash will use a considerably less amount of energy than multiple smaller loads. One thing that Americans aren’t particularly great at in comparison to our friends in Europe is letting our clothes air dry. By drying your clothes on a washing line or on a drying rack, you’re not only completely zeroing energy costs on your drying machine, but you’re also using much less electricity, which is a great lesson to teach your children. With the current need for increased energy efficiency, eliminating you dryer, which is not really needed in the first place, could be a great move. Depending on the size of your child and drying apparatus, you could use this principle as a chore. 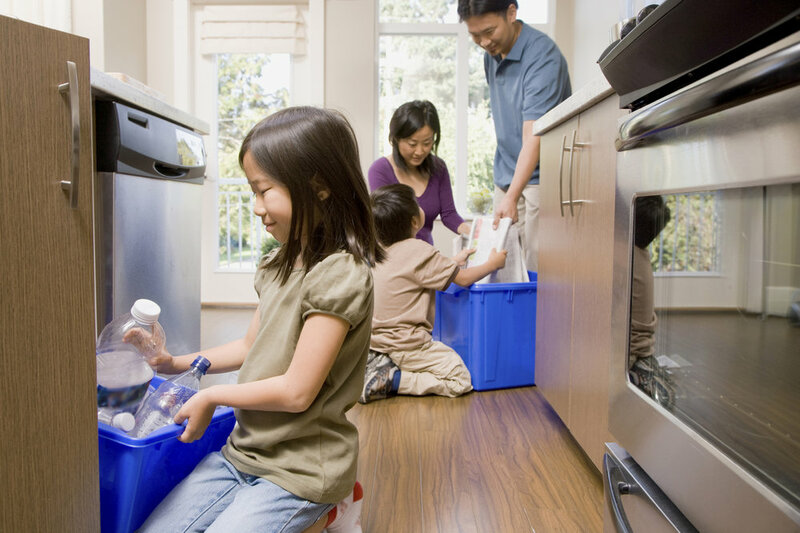 Recycling is perhaps the biggest-impact environmental act that you can do at home. The average plastic container that you put in the garbage will take around 450 years to decompose, which applies to all plastic waste that you throw out, big and small. This sort of plastic is not only adding to the ever growing heaps of garbage in landfill sites but also polluting our environment and destroying wildlife habitats. By the mere addition of a second bin for recycling in your kitchen, your carbon impact would plummet, which is something that needs to taking into future sustainability measures. Giving your child a small monetary or reward incentive to put a certain amount of recyclable items in the recycling bin can be a great way to ingrain a green mentality into your child. Sorting through your recycling together if you separate your paper, plastic and cans could also be a great idea for a chore.